On Thursday, after much anticipation NASA scientists announced a major breakthrough in the search for life on Mars. Based on data collected by the Curiosity rover from the Gale Crater on the red planet, researchers outlined evidence of organic matter on Mars, as well as seasonally shifting methane concentrations in the atmosphere. These two findings are big because both of these pieces of evidence suggest the possible presence of life — or at least past life. But the key words here are “suggest” and “possible.” Saying that NASA found aliens on Mars — as some tabloids have done — is very far from the truth. The fact is that scientists found organic matter, the building blocks of life, on Mars. It’s not totally clear, though, whether these building blocks came from living things or from other sources. Scientists described these major discoveries in two papers published Thursday in the journal Science, but let’s focus on organic matter, as it’s not a term you hear every day. Here’s how it went down: Using the Sample Analysis at Mars (SAM) set of instruments on Curiosity, which includes a drill for collecting samples and a gas chromatography-mass spectrometry instrument for analyzing them, scientists found evidence of four organic chemicals in 3-billion-year-old rocks on the surface of Mars. They also found inconclusive evidence of a fifth organic molecule. But if the discovery of organic material doesn’t mean aliens, then what does it mean? NASA's Curiosity rover sampled rocks and air in Mars' Gale Crater and found some pretty wild stuff. The word “organic” may sound like it means life, but organic matter literally just means chemicals that contain the elements carbon and hydrogen. That’s it. It doesn’t mean alien poop or farts or hair or anything like that. Don’t be disappointed, though, because while those things would be cool as heck, the facts of this discovery are still super rad. “SAM is an incredible instrument, both from a scientific and engineering standpoint. It allows us to make measurements that are critical to understanding the past and present habitability of Mars,” Shaunna Morrison, Ph.D., a project science manager at the Carnegie Institution for Science, who wasn’t involved in this study but published a paper on Martian geology on Wednesday, tells Inverse. 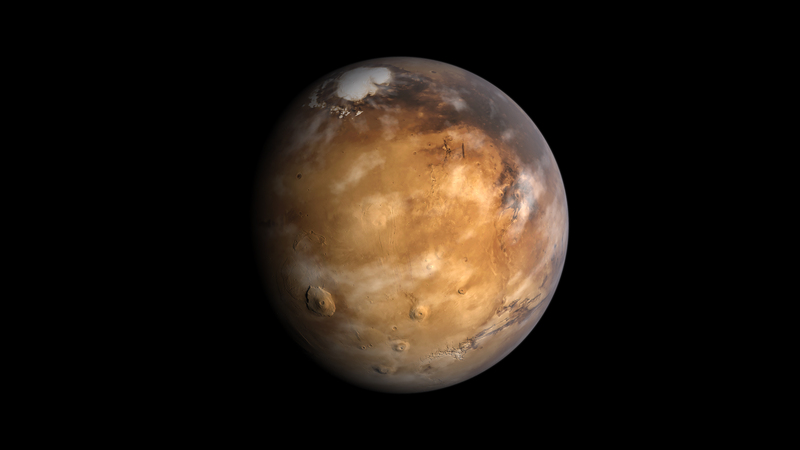 As she points out, digging into the past habitability of Mars could give clues to the future potential for life on the planet because finding organic matter suggests that Mars could have, at some point in its history, had conditions suitable for life. We can tell this because the molecules found in these 3-billion-year-old rocks indicate that the atmosphere on Mars may have been similar to Earth’s when life first began to develop on our planet. So if that’s true, Mars may have also hosted microbial life, and perhaps could again in the future. “Whether it holds a record of ancient life, is the food for extant life, or has existed in the absence of life, organic matter in martian materials holds chemical clues to planetary conditions and processes,” write the authors of the organic matter study, which was first-authored by Jen Eigenbrode, Ph.D., a research scientist at NASA’s Goddard Space Flight Center. Of course, while organic molecules form the basis of lipids, proteins and carbohydrates, they can come from purely geological sources, too. Some of these “planetary conditions and processes” the researchers mention could be totally non-biological. The study’s authors point out that the molecules they found could be the result of asteroids falling to the planet, decomposition of minerals, or other chemical processes. What this research indicates is the need for further study of organic molecules on Mars, and now we know where to look. Unfortunately, what it doesn’t indicate is a cool new species of Martian that we can befriend.